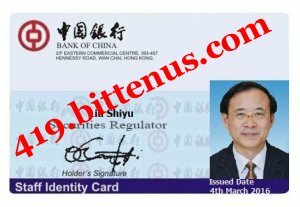 I am Mr. Liu Shiyu, former President of the Agricultural Bank of China and current China Securities Regulatory Commission (CSRC). I received your response to my brief message, and I wish to apologize for any inconveniences. I am getting in touch with you regarding the estate of a deceased client with an investment placed under our banks management 12 years ago. I am sure you are wondering where I got your contact details. A search on web with your email () gave me some results and I selected you from the lot. I would respectfully request that you keep the contents Of this mail confidential and respect the integrity of the information you come by as a result of this mail. I contact you independently and no one else is informed of this communication. In 2006, the subject matter, Mr. Mark made a deposit of Forty Five Million, Two Hundred and Seventy Five Thousand Dollars ($45,275,000.00) only in my branch, a number of notices were sent to him two years later for not operating the account and we later discovered that Mr. Mark had died in a plane crash. The good thing is that late Mr. Mark did not declare any next of kin in his official papers including the paper work of his bank deposit. What bothers me most is that according to the laws of my country, at the expiration of 12 years the Fund will be revert to the ownership of the Hong Kong Government if nobody comes for the funds, Against this scenery, I have all the information needed to claim these funds and I want you to act as the next of kin to the deposit. No risk involved in this matter as I hold the key to the funds and we are going to adopt a legitimate method as I will have all paper works to make you the next to kin to the funds when you provide your correct details. I want you To know that you will be entitled to 40% of the entire funds while I get 60% as the originator of the deal. Get back to me for more information. Please provide me with the following details below at once, so that I can have my attorney arrange the necessary paper works in your names and send you copies. I am Mr. Liu Shiyu, former President of the Agricultural Bank of China and current China Securities Regulatory Commission (CSRC). I received your response to my brief message, and I wish to apologize for any inconveniences. I am getting in touch with you regarding the estate of a deceased client with similar name as yours and an investment placed under our banks management 12 years ago. I am sure you are wondering where I got your contact details. A search on web with your name gave me some results and I selected you from the lot. I would respectfully request that you keep the contents of this mail confidential and respect the integrity of the information you come by as a result of this mail. I contact you independently and no one else is informed of this communication. In 2006, the subject matter, Mr. Mark Young made a deposit of Forty Five Million, Two Hundred and Seventy Five Thousand Dollars ($45,275,000.00) only in my branch, a number of notices were sent to him two years later for not operating the account and we later discovered that Mr. Mark Young had died in a plane crash. The good thing is that late Mr. Mark Young did not declare any next of kin in his official papers including the paper work of his bank deposit. What bothers me most is that according to the laws of my country, at the expiration of 12 years the funds will be revert to the ownership of the Hong Kong Government if nobody comes for the funds, Against this scenery, I have all the information needed to claim these funds and I want you to act as the next of kin to the deposit. There is no risk involved in this matter as I hold the key to the funds and we are going to adopt a legitimate method as I will have all paper works to make you the next of kin to the funds when you provide your correct details. I want you to know that you will be entitled to 40% of the entire funds while I get 60% as the originator of the deal. Get back to me for more information. I got your email first provide me with the following details below at once, so that I can have my attorney arrange the necessary paper works in your names and send you copies. From there i will instruct you on how to do this. I am in receipt of your email, and with regards to this mail, as I have promised, attach is a copy of my Identity Card, Letter of Agreement, which you are to print and sign for agreement for this deal to proceed after you have done that i will send you the Bank Statement, and please be advise for security reason that this is for your eyes only, because am not suppose to disclosed such sensitive information to anyone, and be advised that i am sending it in good faith that you won't betray me as my partner. Thanks my good friend for giving me the opportunity to respond to your last correspondence. While some of the stories you know are true, some others are far from it. People actually transfer funds out of here. How else do you think past Bank office holders become rich after office? How come the same people who have worked in the banking industry in the past, are the same people running big time companies today? It is through shady deals that they do guarantee themselves a better standard of living and they are able to propel themselves to seek for political assignment after retiring from the banking industries. At this point, I should let you know that this project is capital intensive. I need your total devotion and trust to see this through. I know we have not met before, but I am very confident that we will be able to establish the necessary trust that we need to execute this project. I have already sent you a copy of my Work ID for you to know whom you are transacting with. on the other hand, I will need you to send me a copy of any form your identification with your names on it (Driver's license or International passport or Working ID). A transaction of this nature which involves high volume of liquid money (not stocks), all parties concerned must have absolute faith and trust in one another, otherwise failure is inevitable I will also advice that it is by your will; I am not forcing you into this project it is your right to accept or reject now rather than acceptance and betrayal later on. I have given you my full trust. I want us to enjoy this money in peace when we conclude so you should listen to my instructions and follow them religiously. Firstly, I can not do a direct wire transfer of the funds to your account in your country because your Government will be nosy about the source of funds and we will be caught Secondly, I can not setup an Offshore Account in my name because when I transfer the funds out of my bank here in China it will be detected by my bank's monitoring system and also I will get caught before I even leave the country. The best way I have found, I am doing everything legally required to ensure that the project goes smoothly; I have started all legal preparation of document with the help of my attorney to place you as the Next of Kin / legal beneficiary of the funds ($ 45,275,000.00). These documents can be issued as reference to source of funds. I need you to setup a Secret Numbered Offshore Account in your names with a foreign bank, I will be providing to you in my next email. As result of this, I need you to take care of the cost of opening this Secret Numbered Offshore Account so that it cannot be traced to me for safety purpose. Once I transfer our funds ($ 45,275,000.00) out of China to the Secret Numbered Offshore Account you are opening, the transfer will be untraceable (It will protect us from my bank and my Government). You do not have to be present physically in the foreign bank as the Secret Numbered Offshore Account can be opened right from your home online. A Secret Numbered Offshore Account provides account holders with a degree of bank privacy in their financial transactions thereby avoiding arbitrary government interference, Scrutiny and heavy-handed taxation burden. Furthermore kindly sign the agreement document and get back to me now so that we can move to the next step.